If I tell you this is easy, that would be untrue. Leading an SME is challenging and seeking help for those challenges can be difficult as we allow our ego to make us fear sometimes. It could be due to cost, lack of experience in an area and or worse; burn out. The challenges are there. But when we add the complexity of a competitive market, the pressure on pricing and the high expectations of customers to receive better quality goods and services; the leaders of SME’s will have to face a colossal challenge. When do you have time for planning, strategizing, analyzing and reflecting on the short term and mid-term results? Not to mention the five years long term plan. A boutique consulting firm is an extended member of the family and much more affordable than you think. Often consulting services are looked at as unnecessary, where SME owners or managers decide to do everything in-house. Sure, you can do it, but have you thought about your capacity and about the luxury of taking your eyes off the horizon? Do you have the manpower and the real, not the claimed, expertise in house? Have you ever thought about the opportunity cost? Are consulting fees a real direct cost, or they are more an investment which has a direct or indirect positive contribution to your topline, cashflow and overall operational efficiency? Is it better to pour our expenses in marketing cost in the hope of grabbing the attention of our target market? Or it would be more beneficial to optimize the cost and reallocate a solid portion to consulting services? Have we at any point questioned our product/service, our quality of service, our competitive landscape, our operational efficiency. Have we ever questioned our own business? These are questions where SME leaders have to face every single day. If you are the captain, think about your advisor as your first officer on board. You will always have a backup, someone to challenge and someone who will challenge you, all in the sake of improving your operational efficiency. A study from the Harvard Business Review (‘Consulting is more than giving advice’ – Arthur Turner, September 1982 issue) is proven to remain true in the brink of the digital revolution in the 21st century. Many consulting assignments are covering the “Traditional Purposes” as outlined in the chart below. The challenge is to move to the top of the pyramid to reach the “Additional Goals”. This is achievable by selecting the right boutique consulting firm, a specialized and dedicated firm in delivering excellence. 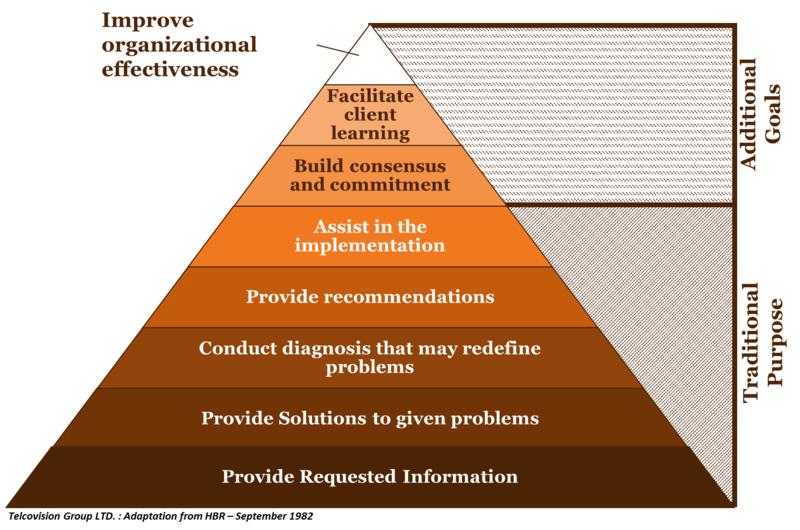 Getting to the top of the pyramid is easier with a boutique management consulting firm, due to its flexibility and its willingness to provide a tangible added value to its customers. 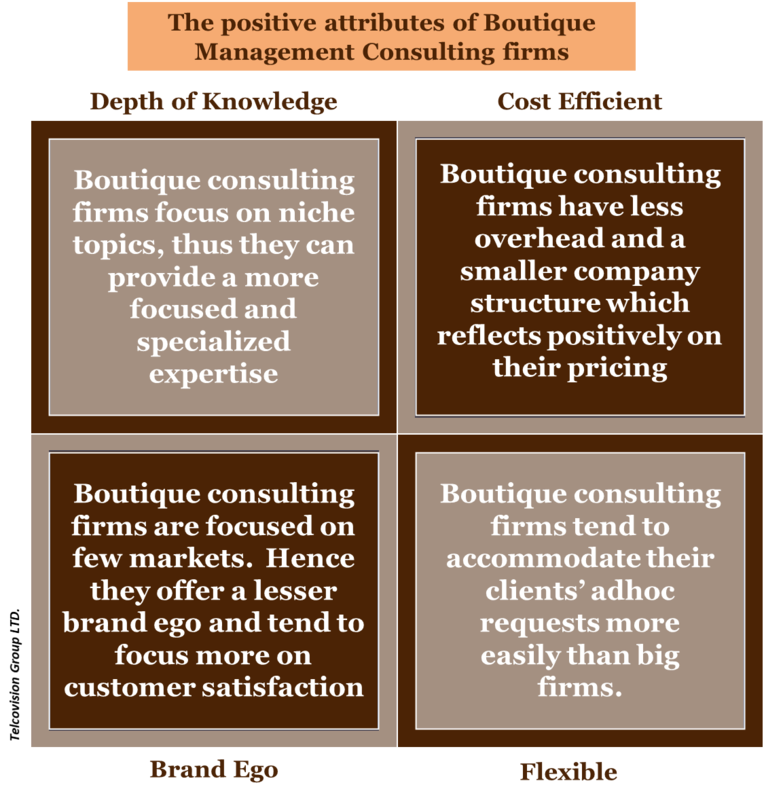 SME’s should not undermine the importance of having a boutique consulting firm by their side. The benefits outweigh by far, the risks of not having the right support.